In May 2017, Dustin Poirier and Eddie Alvarez were on their way to producing an instant classic before a controversial ending prompted a no contest ruling. 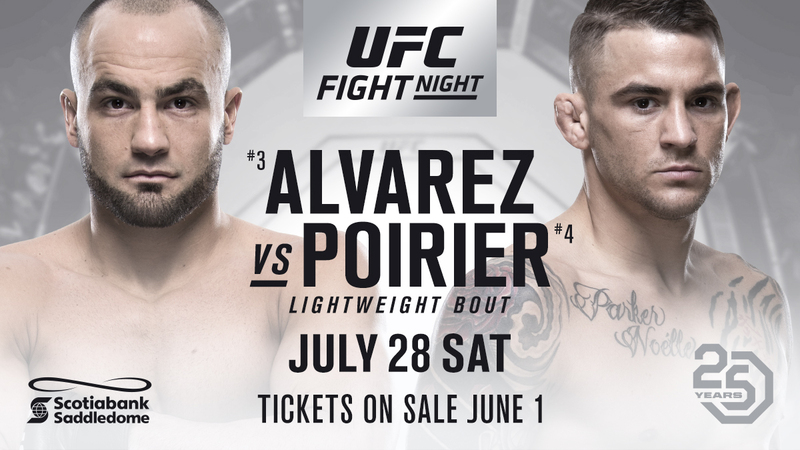 But on July 28, the two lightweight action heroes will have five rounds to settle their score when they battle in the main event of UFC Fight Night at Scotiabank Saddledome in Calgary. Tickets for UFC Fight Night, which airs live on FOX, go on sale to the general public at 10am MT on June 1. Since their first bout, anticipation has been high for a rematch, and with the No. 3-ranked Alvarez coming off a Fight of the Year win over Justin Gaethje and the No. 4-ranked Poirier scoring stoppages of Gaethje and Anthony Pettis, the stakes are higher than ever as these rivals look to secure a world title fight with a win this summer. Stay tuned to UFC.com for more fight card information.